Collaborator Says Maurice Sendak Would Be 'Jumping For Joy' Over New Publication More than 20 years ago, Maurice Sendak and Arthur Yorinks collaborated on a book called Presto and Zesto in Limboland. But they were both busy with other projects, and never bothered to publish it. Maurice Sendak wrote and illustrated Where the Wild Things Are and In the Night Kitchen. The illustration above is from Presto and Zesto in Limboland, a book he completed with his friend Arthur Yorinks more than 20 years ago. Sendak died in 2012. 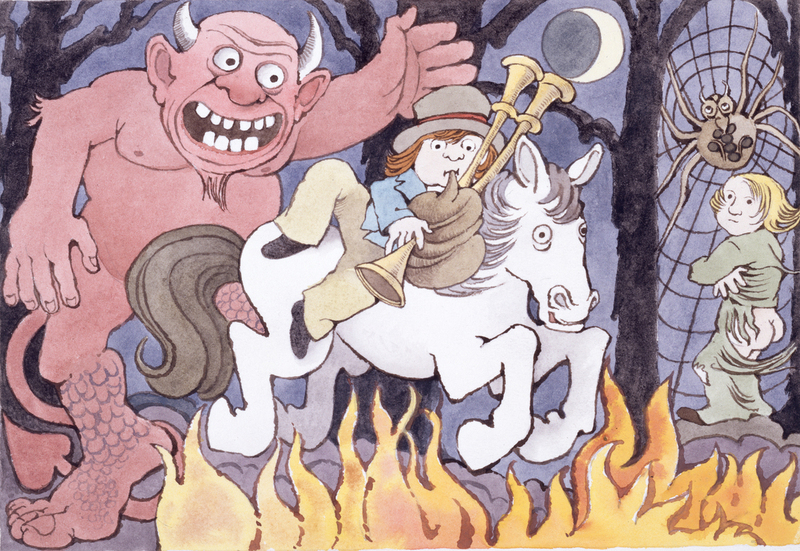 More than 20 years ago, children's author and illustrator Maurice Sendak and his friend Arthur Yorinks collaborated on a book. But they were both busy with other projects at the time, and they never bothered to get it published. Sendak died in 2012, but that decades-old collaboration, Presto and Zesto in Limboland, has been rediscovered. Sendak's pictures, Yorinks recalls, were made to illustrate "some disparate nonsense rhymes" set to music by Czech composer Leos Janacek in the suite Rikadla. The images were projected during a performance by the London Symphony Orchestra. "We decided one day to put all the pictures on his drawing table," Yorinks says. "And we began to — like two old jazz musicians — kind of riff on various stories. And lo and behold, it started as a bit of a lark, but it ended up being a complete narrative." That narrative is a testament to the decades of friendship between the two men — and will be published in fall 2018. It was found by Lynn Caponera, the head of the Maurice Sendak Foundation, in a file folder ... and it was totally complete when it was found so we didn't really have to do much. They're actually us — Maurice and myself. The main drift of the story was a kind of homage to our long-standing friendship. In a rather anecdotal way, Maurice had given me the nickname "Presto." I didn't want to let him get away with giving me a nickname ... so I named him "Zesto." And so we used those names for the characters in the book because the book is about friendship surviving in a very, very mixed-up world — so we indulged ourselves. No, he didn't. And the nice thing about it is — as the old saying goes — I was there. And Maurice would have been totally, totally delighted to have this out. We fully intended to do something with this book and publish it at some point in time. We both thought the book was hilarious, and fun, and full of life, and if he was around he would be jumping for joy that it's being published. ... It's a wonderful epilogue to our friendship to have this book come out, and it's certainly a terrific addition to Maurice's enormous and glorious canon of work. Gabe O'Connor, Lee Mengistu and Emily Kopp produced and edited the audio of this interview. Beth Novey adapted it for the Web.